This story is featured in the October 2017 issue of Traverse, Northern Michigan’s Magazine. Get your copy! It’s chilly enough for my husband to add wood to the stove well after midnight, chilly enough for me to hustle over and stoke still-glowing embers as soon as morning breaks. The sky matches the color of the smoke curling up from the chimney. Gray and wispy and a little tired, much like I feel after a long, full summer in Northern Michigan. The sky is a blank canvas holding my attention for a second, maybe two, before I shift to the woods. 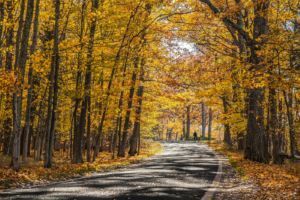 To the colors I’ve always felt the most kinship with: vibrant yellow veins of autumn aspen leaves; blazing reds and oranges of sugar maples and dogwoods and oaks; the ombre sumac and tan of a beech tree. Fall colors peak when shorter days combine with dropping temperatures. The scene outside my window serves as an urgent reminder to let go of my to-do list. To get in the car and drive north through a true tunnel of trees, windows down and good tunes cranking. 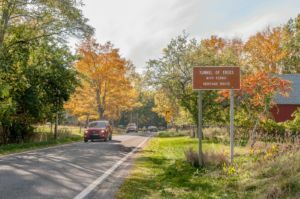 M119 between Harbor Springs and Cross Village is a scenic heritage highway. Narrow and winding—with a few good belly-dipping hills—it follows the high bluffs of Lake Michigan’s shoreline. 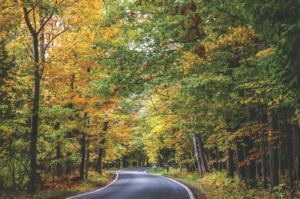 Hardwood forests and evergreens flank the asphalt, and the dense woods give way occasionally to golden fields and barns and a smattering of cottages. I rarely travel this road for more than few miles; life is busy and the twisty two-lane is a drive that demands sticking to the speed limit, or slower. 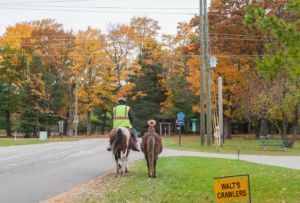 There are other routes to reach the northwest rim of Emmet County, and I opt for their ease, their likelihood to be free of most on-vacation drivers. Except in the fall. I don’t remember when it became a ritual, but at some point I started seeking an annual day of experiencing M119’s autumn glory. A solo 40-mile roundtrip cruise on one of the most famous roads in Michigan. Of course, I waffle every year, wondering if I can make the time or if it’s worth the potential of gawker traffic and its accompanying dawdler crawl of a pace. I worry I somehow won’t feel the magic of seasons past. And then I wake up to these colors. And I know I need to go. My coffee rattles a little in the car, lake stones and sand still lining the cup holder. Touchstones of months we spent swimming and watching the sun slip into ever-changing blue water. A pang of guilt hits once I pull out of my neighborhood and head west for a handful of miles to catch M119. No kids jostle around in the backseat. No husband co-piloting, no dogs shaking and shedding and panting in hopes of hitting the beach. I’m alone, save the voice echoing from my stereo (May Erlewine, “On the Mend,” on repeat). This is a rare experience for someone who likes the noisy distractions of everyday life. It’s a little uncomfortable. A nervousness and spark all at once, like brisk wind surfing across my hand as I drive. Fall in Northern Michigan speaks to the passage of time. 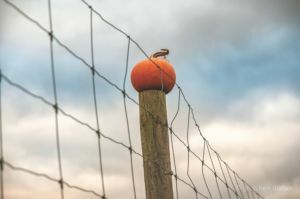 It makes us hyper-aware: of the three inches one child grew over the summer; the quiet distancing that comes when a teenager stretches toward adulthood; the new wrinkles and the comfortable laughter of old friends. We feel this rhythm deep in our bones as the water turns steely, as leaves shift from green to the vibrant hues, which are followed like clockwork, by winter. Maybe that’s why I carve out a day to drive slowly and soak up this autumn road. Soak up rays of sunshine burning through the clouds by midafternoon. Soak up the friendly conversations with fellow color-tourers in warm general stores or along hiking trails. Soak up the emotions traditions evoke. Looking down to the left, there’s a peek of waves churning and lashing in building fall winds. Looking ahead, trees arch from either side of the asphalt. They curve into a tunnel of brilliant yellow. This is something I count on, the waves and wind and fever-pitch color of leaves. Nature has a way of reminding us about the cycle of life. Years pass but this season remains a steady and constant anchor for our stories. So I pay close attention to what this road offers today. I let my mind swing from present moment to past drives, the solo ones and together ones, with my loves and hot cider and feet on the dashboard. At one point, I pull over because I see a doe and a fawn without spots, tucked in the shadows. I watch the still, silent mother. She watches me, too. An understanding passes between us, or not, but it feels a little holy all the same. Another car zooms past, and the deer dart away. I move on, heading north, filled to the brim with gratitude for this moment. This place. This life. 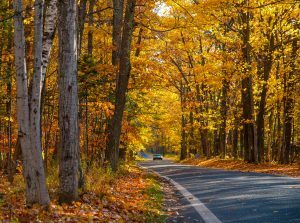 Color tour drives make great day trips, but fall in Emmet County is worth a full weekend. 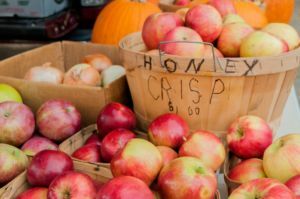 Here are a few insider tips for your autumn getaway. 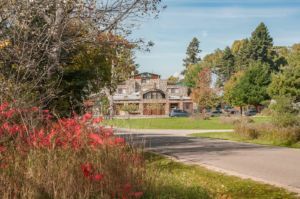 Stock up for the road with a famous Gurney’s Sandwich in downtown Harbor Springs, but don’t leave town without swinging up to the town’s bluff to take in the harbor, homes and downtown buildings below; we’re talking real life Norman Rockwell painting. We suggest leaving the car parked behind Gurney’s Bottle Shop and walking up the nearby Spring Street boardwalk, which includes a viewing platform at the top. Twelve miles north of Harbor Springs, stop at Trillium Woods Vintage Boutique for excellent expresso and antiques. Pullover in Good Hart: One of the best chicken pot pies you’ll ever taste is found inside the Good Hart General Store, halfway between Harbor Springs and Cross Village on M119. This is a must stop spot for lots of reasons: the adorableness factor (bright red paint, striped awnings, white trim add up to a perfect photo backdrop); fun scenic highway souvenirs; you’ll get to meet Maggie the Hound and her humans, too. Right next door, stop by the crepe cart in front of Primitive Images for sweet and savory breakfast and lunch options, and enjoy a warm pot of tea out back at Good Hart & Soul Tea Room. Keep the car parked and stop by A Studio. The darling boutique has antiques, apparel and art. 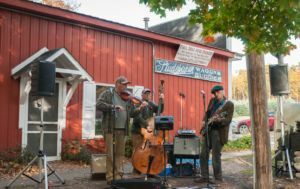 Cross Village, 20 miles north of Harbor Springs along M119, owns the quirky-cool northern vibe. Three Pines Studio includes an eclectic and stellar collection of art. Owners Gene Reck and Joann Condino also make some mighty good coffee and better conversation. Lovers of Polish food and/or lumberjack-worthy decor need to head a block closer to the lake for a Legs Inn dinner. This beloved stone and timber establishment shuts down for the season on October 22. 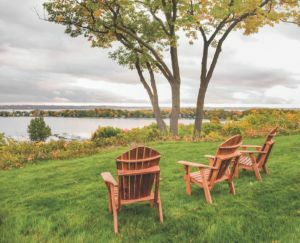 Order the Waugoshance Salad and Golabki, and stay for sunset on the lakeside lawn. You won’t be sorry. Bring Your Hiking Shoes: In Emmet County alone, Little Traverse Conservancy boasts nearly 100 nature preserves—including 21 with trails and dedicated parking. An easy to use, interactive online map helps with spontaneous picnic stops and walks. 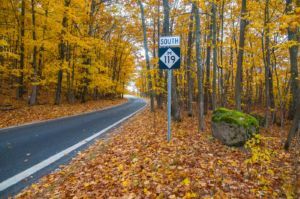 We’re partial to Good Hart Farms in the fall, with its 7.5 miles of marked trails that include a maple, ash and beech forest. 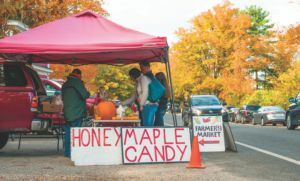 To get there when heading north on M119, turn right on Robinson Road (which is just south of the General Store) and head east about two-and-a-quarter miles to the Hannah Road parking area. Celestial Magic: Appreciate autumn’s hues by day and the starscape at night at The Headlands, one of 10 International Dark Sky Parks in the world, located near Mackinaw City. Program director Mary Stewart Adams carries a bit of celestial magic, so catch an event if you can. October’s schedule includes a Harvest Moon program on the 6th and on the 21st, celebrate the peak of the Orionid Meteor Shower at the 9th annual Headlands Challenge. To get there from M119: continue onto West Sturgeon Bay Trail and Cecil Bay Road, then Wilderness Park Drive to Headlands Drive. midarkskypark.org. 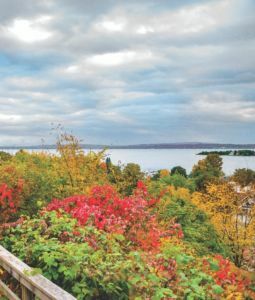 Boyne Highlands: For its fall specials and chairlift rides for ultimate color viewing. Trout Creek: Condos that include access to an indoor/outdoor pool and well-marked woodland trails. Best Western of Harbor Springs: Basecamp right on M119 between Harbor Springs and Petoskey. Nice rooms, nice pool, and nice employees with plenty of local knowledge on everything from the best cider and donuts to additional drives. Kate Bassett is news director at the Harbor Light newspaper. Her first novel, Words and Their Meanings, is available in bookstores and on the web. midarkskypark.org. // Gretchen Dorian is a photographer with a passion for water and the landscapes provided in her backyard of Emmet County. Check out some highlights at www.gretchendorian.com.